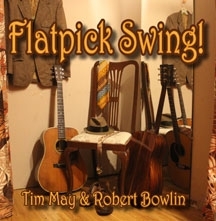 Flatpick Swing is a phenomenal flatpicking guitar recording by two of the most talented flatpick style acoustic guitar players in the world - Robert Bowlin and Tim May. On this recording Tim and Robert play standard swing jazz tunes on flat top acoustic steel string guitars. They are accompanied on acoustic upright bass by Glenn Meyers. Tim May also adds his vocal talent to one tune ("Sheik of Araby") and Wil Maring sings on two of the songs ("Back In Your Own Back Yard" and "I'll See You In My Dreams"). Tim and Robert put their technique, skill, and energy of the flatpicking guitar technique into their renditions of these wonderful old swing jazz standards. This is a "must have" recording for any fan of flatpicking guitar music.